Schools and colleges do not teach pro American history anymore. Instead they teach redistribution of wealth, liberal agendas, Sharia acceptance, anti USA topics and racism against white people. We can't teach Christianity or Judaism, but they can teach Islam. We teach George Washington and our founders were bad people. We teach early grades about transgenderism. We teach liberals are good and Conservatives are bad. We teach racism against white people as if it was in fashion to do so. The Pacific Education group even gives guidelines not to discipline minorities for being late because it is their culture (how racist is that!?) Yet, the white student must stay after school or be sent to the Principal's office. Even black teachers are upset by this as they say it does not prepare the minority student for real life. Like the media, a disproportionate amount of teachers give to Democrat causes. 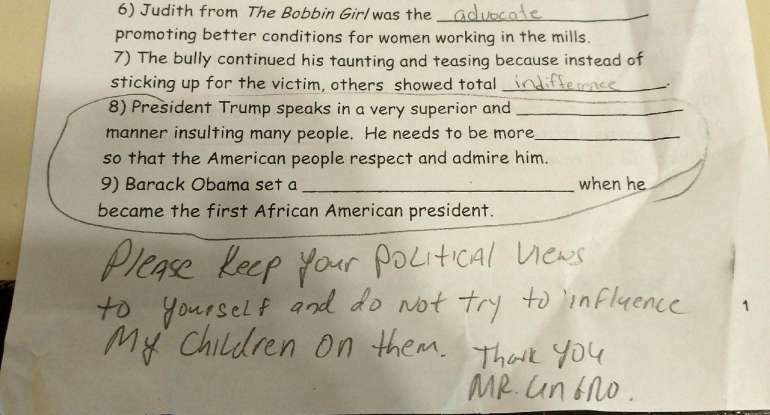 ​Liberal teacher bans student from choosing Trump as her 'hero' for project. Teacher suggests Obama instead. U.S. School BANS All Christmas Carols That Mention ... JESUS? Drag Queen Admits Story Hour Is For "Grooming Of The Next Generation"
Trumpaganda? The eerie Trump Derangement Syndrome escalating in academia. JUST IN: Stephen Miller's third-grade teacher suspended! Why Is This Being Taught in Public Schools? There is an agenda going on: This brainwashing need to stop NOW!